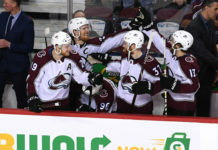 The Avalanche power play was a perfect two-for-two Tuesday night and after a 3-2 final score, Colorado won a regular season game in Nashville for the first time since March of 2016. Going into the game, the Avalanche were tied with the Winnipeg Jets for the best power-play percentage in the league. While the Predators played a decently disciplined game — getting sent to the penalty box only twice — the Avalanche made them pay both times for their league-leading 25th and 26th goals with the man-advantage. Nashville was first to get on the scoreboard after the Predators were on the rush and a pass bounced off of Sam Girard and past Semyon Varlamov. Just a couple minutes later, a Mattias Ekholm holding call gave the Avs their first power-play opportunity. Nathan MacKinnon was credited for the goal after it ricocheted off of Pekka Rinne and a Predators defender, evening the lucky-bounce goal count — and score — at one. The Avalanche took their first lead of the game just over six minutes into the second period when Nathan MacKinnon scored his second of the night. 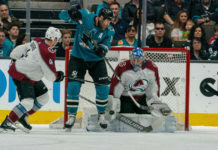 Mikko Rantanen who, along with Girard, assisted both of MacKinnon’s goals, found MacKinnon cutting across the slot, before waiting for the right moment and shooting the puck past Pekka Rinne from the bottom of the faceoff circle. The goal was his 17th of the year, giving him the sixth-most goals scored in the NHL. 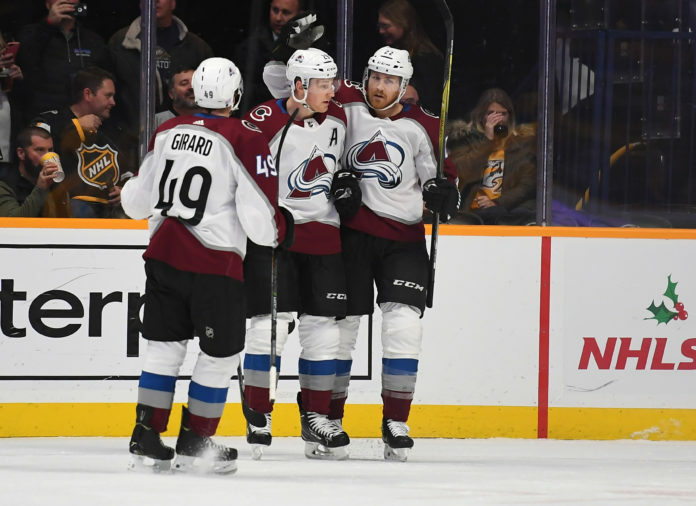 The Avalanche only had the lead for 2:46, and Nashville continued to be a thorn in Colorado’s side as they tied the game at two on a great redirect goal by Kevin Fiala. A third-period penalty for tripping was called against the Predators, and Colorado capitalized. Tyson Jost scored a wrister off of a give-and-go with J.T. Compher. With the assist, Compher’s impressive start to the season continues, as he has eight points in eight games — and Jost’s fourth goal of the year would be the final scoring play of the night. Semyon Varlamov was in net for his ninth win of the season and fifth in a row. Varlamov had a great game and played a major role in the win stopping 36 of Nashville’s 38 shots, 20 of which in the third period. The Avalanche have now won five games in a row as well and made a statement beating Nashville on Tuesday. There’s no time for them to be proud of themselves, however, as they turn around and play the second night of a back-to-back Wednesday against the always-difficult Pittsburgh Penguins. Luckily for the Avalanche, Pittsburgh too will be on the second night of a back-to-back having played and beat the Winnipeg Jets Tuesday night. Puck drop Wednesday night will be at 7:30 PM and will be nationally televised.